School counselors are just one part — but an important part — of a system that ensures students have excellent educational experiences. As part of a school support team, school counselors provide critical social-emotional and academic supports. Through a comprehensive school counseling program that promotes success and achievement for all students, school counselors can help set students on a path for postsecondary success. In particular, students of color and students from low-income families benefit from having more access to school counselors. For example, Black students are more likely than their White peers to identify their school counselor as the person who had the most influence on their thinking about postsecondary education. And research links the student-to-school-counselor ratios that meet the American School Counselor Association (ASCA) recommendation in high-poverty schools to better academic outcomes for students, such as improved attendance, fewer disciplinary incidents, and higher graduation rates. Simply put: There are not enough school counselors in the U.S. The ASCA recommends that schools maintain a ratio of 250 students per school counselor, and that school counselors spend at least 80 percent of their time working directly with or indirectly for students. 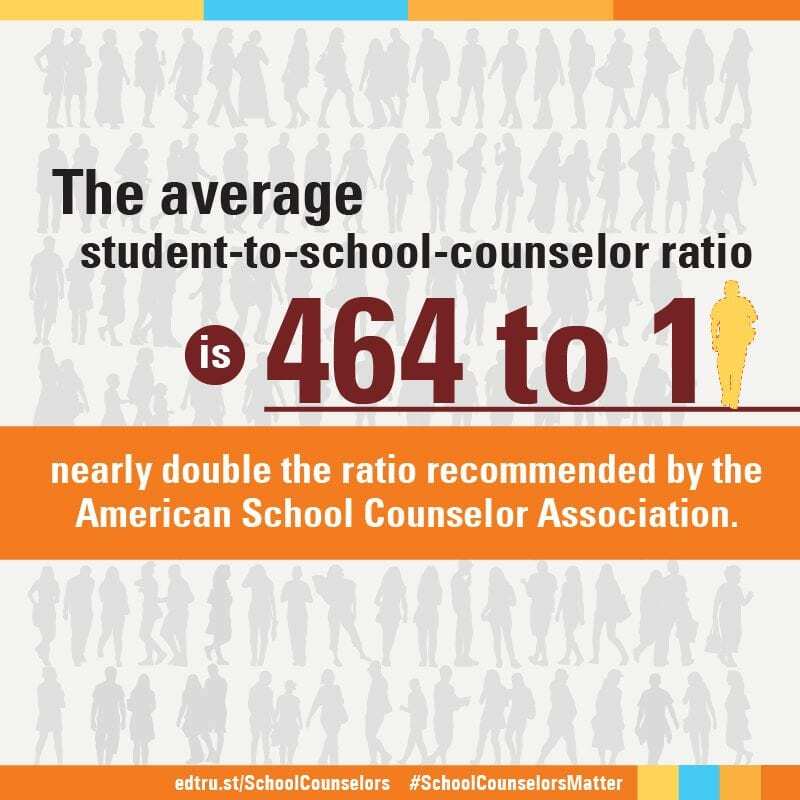 Across all schools, the average student-to-school-counselor ratio is 464 to 1. Across high schools, the average student-to-school-counselor ratio is 311 students to 1.
there are 11 million high school students who are enrolled in a school without enough school counselors. Too often, school counselors are not available to students of color and students from low-income families. Students of color and students from low-income families have been overlooked and underserved for far too long. 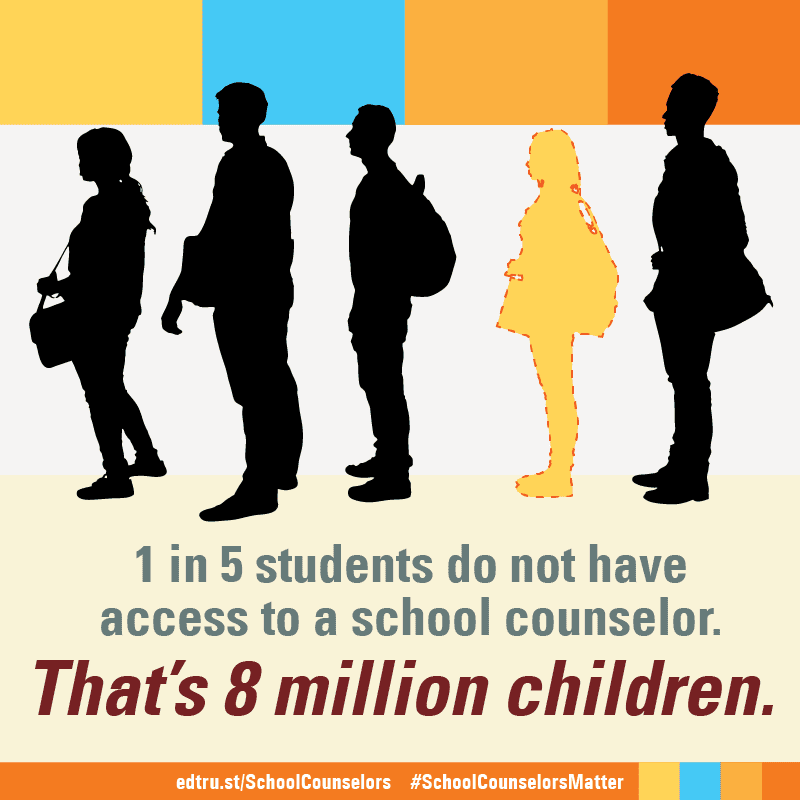 If anything, they deserve more access to school counselors than their peers — not the same, and certainly not less. And yet, the schools serving the most students of color or the most students from low-income families are shortchanged when it comes to school counselors. Across all schools, 38 states are shortchanging either their students of color, students from low-income families, or both. Across high schools, a school counselor who serves predominantly students of color has to serve 34 more students every year than a school counselor who serves fewer students of color, and 27 states are shortchanging either their students of color, students from low-income families, or both. 38 states are shortchanging either their students of color or students from low-income families, or both. These data paint a clear picture: In too many states, students — especially students of color and students from low income families — do not have meaningful access to counselors. School counselors can play a critical role in ensuring that students get opportunities to have safe, enriching experiences in and out of school, and in helping prepare students for postsecondary success — all in ways that meet their individual needs. But it’s difficult to do that meaningfully if school counselors are responsible for supporting unmanageable numbers of students. Is there a set requirement for the number of school counselors per school or per number of students? If so, are the requirements being met? If not, what is the strategy for ensuring that there is an adequate number of high-quality school counselors in each school? Are there particular districts across the state where the problem is most pronounced? If so, what can be done to support those districts to place more school counselors in schools? What, if any, funding can be leveraged in the short term to address the most severe shortage areas? In the long term? How is the state or district ensuring there is a pipeline of school counselors? 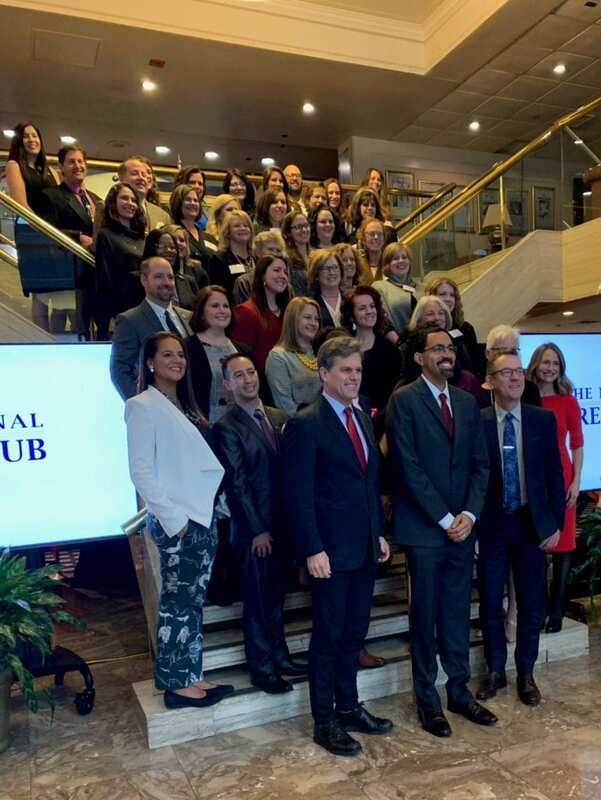 How does that strategy include partnerships with colleges and universities to appropriately train new school counselors? What are the policies or procedures for allocating school counselors across districts or schools, and why is the distribution of school counselors inequitable? What is the strategy for providing more school counselors in high-need schools?